Nite Ize is known for creating products that make your life easier at home, at work, and on the go. Our trusted Original Gear Ties are a favorite around the world for that exact reason. The patented Gear Tie Original is the most versatile way to wrap, hang, and organize nearly anything. Featuring a strong bendable wire interior that holds its shape and durable rubber exterior, Gear Ties can be twisted, tied, and reused over and over, indoors and outdoors. They are waterproof, UV-resistant, and durable - they'll even hold up to salt water, and they have a soft rubber exterior that won't scratch, mark or ding. Whether looking for a colorful organizational wrap, a solution for messy cords and wires, a way to make DIY projects easier, or the most versatile tool for your work site, discover for yourself why so many people find Gear Ties to be indispensable. 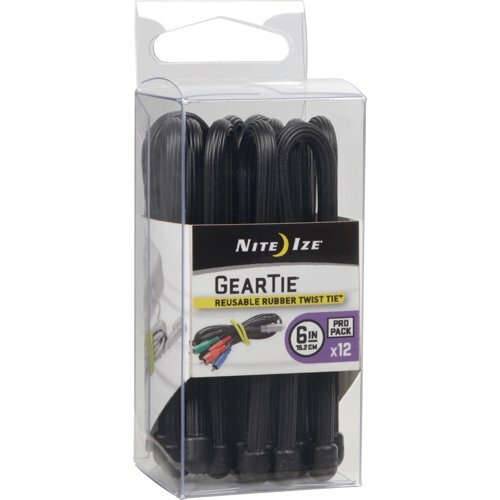 The 6"" Gear Tie is the perfect solution for containing and organizing medium to long cords and cables, hair dryers, kitchen appliances, and all those other electronic items you need every day. Each measures 6"" x .24"" x .24"" and weighs a mere .11 oz. Twist it, tie it, reuse it! •	DURABLE, WATERPROOF + UV RESISTANT - Perfect for use both indoors and out. They will even hold up to salt water! CONVENIENT 12 PACK - This convenient 12 pack gives you enough gear ties to manage your desk, drawers, tool box, or any other space that needs organizing. REUSABLE RUBBER TWIST TIES - Our 6" Gear Ties have a soft rubber exterior that is colorful, UV resistant, and holds shape. The perfect all-around organizer for home, office, travel and more. MULTI-PURPOSE - Reusable, bendable ties can be used as cable ties, cord organizers, rubber twist ties for headphones, for closing produce, snack and goodie bags, shoring up plant and flower stems and more, all with a simple twist. DURABLE AND WATERPROOF - A Strong internal wire and soft rubber exterior makes for a durable, UV resistant, reusable, waterproof Gear Tie that holds shape and provides excellent grip. It will even hold up to salt water! COLORFUL CABLE TIES - Use colorful 6" Gear Ties as cable ties or cord organizers that add a punch of color, and also help you stay organized with color-coding. SAFE + SMART DESIGN - 6" Gear Ties have a soft rubber exterior that won't scratch, mark or ding. They are easily mountable to many objects. Each measures a functional 6" x .24" x .24" and weighs a mere .07 oz. Save with Gear Tie ProPacks. These convenient multi-packs are a great value and make multiple wrapping, hanging, or looping jobs a breeze.